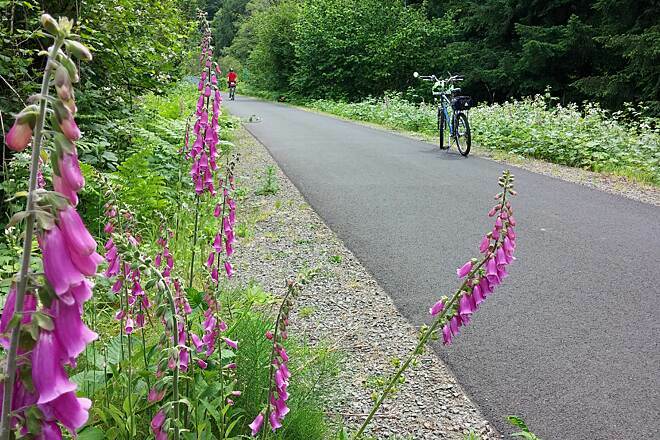 The Springwater Corridor comprises the southeast segment of the 40-Mile Loop regional trail system encircling the greater Portland area. The origins of the Loop come from a 1904 proposal by visionary landscape architects, the Olmsted brothers, who—during the planning process for Portland's Lewis and Clark Centennial Exposition—put forth a plan for a 40-mile system of parks and greenways connected by boulevards. 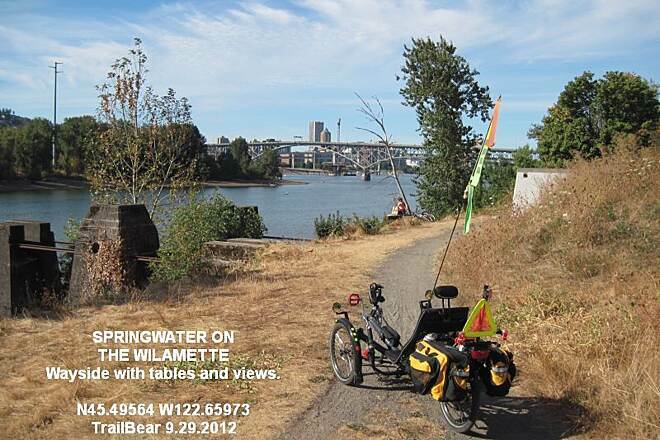 Today, the family–friendly Springwater Corridor follows the banks of the Willamette River from downtown Portland to Johnson Creek and then parallels Johnson Creek through neighborhoods, industrial districts, park refuges, and wetlands—eventually ending in the town of Boring. Portland's light rail and city buses enhance options and ease of travel along the route's length. 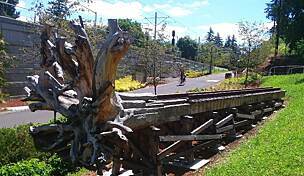 The history of the trail stretches back to the early 1900s, when a rail line was built to bring people, produce, and timber from areas south and east of Portland into the growing metropolis. Known variously as the Portland Traction Company Line, the Cazadero Line, or the Bellrose Line, the railroad finally adopted the name Springwater Division Line, though neither the railroad nor the trail that bears the town's name ever reached this small community. 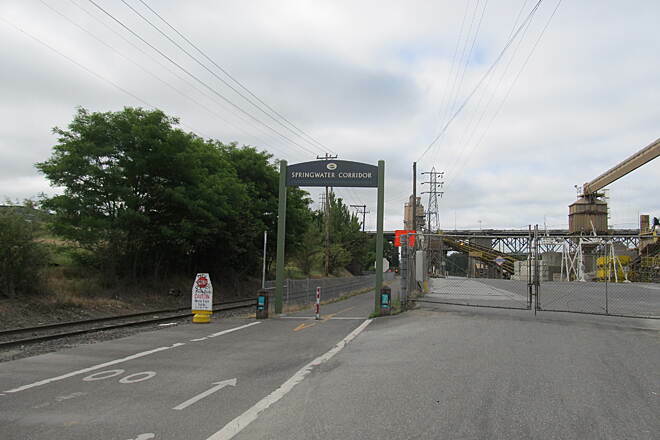 In 1990, Portland bought the railroad corridor, which had ceased its passenger service in 1958 and its freight and timber hauling in the 1980s. The multiuse trail opened in 1996. 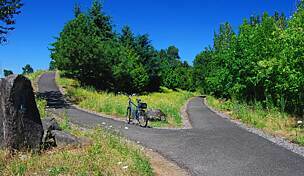 For a recreational tour, start at the Johnson Creek Boulevard trailhead; it provides ease of parking and avoids the on-road section between Ninth and 19th Avenues. 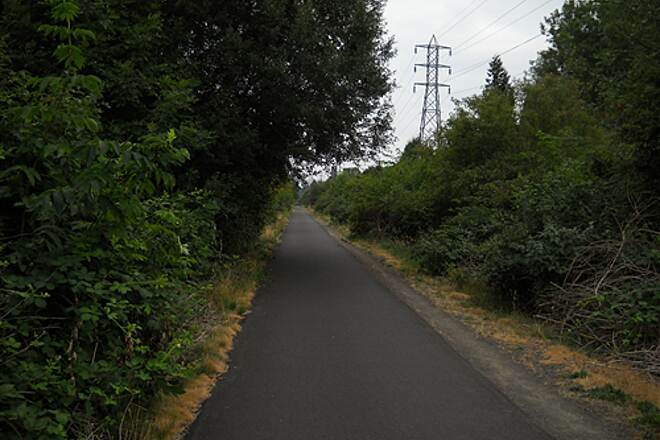 Sellwood Riverfront Park is an alternate start point and worth a visit if you don't mind this bit of road section. The downtown start at SE Fourth Avenue and SE Ivon Street is another option. 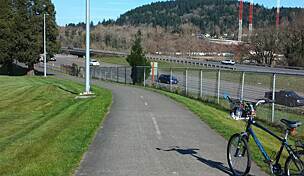 To avoid an industrial section from mile 8, which is not well traveled during the week or at night, choose the trailhead east of the I-205 Multi-Use Path at Flavel Street. The Johnson Creek Boulevard trailhead sits at mile 6. If you backtrack a bit to cross the creek, you'll find a natural area. At mile 9, you'll cross the I-205 Multi-Use Path. If you continue east on the Springwater Corridor, you'll go under I-205. Equestrian use is most common east of I-205, where a separate soft-surface path meanders away from the main trail where topography allows. 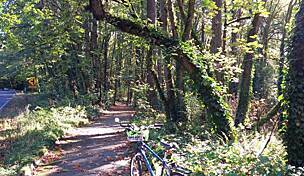 On the eastern half of the trail, you'll reach the Beggars-Tick Wildlife Refuge at SE 111th Avenue. And a right onto SE 122nd Avenue leads to the 17-acre Leach Botanical Garden, which boasts more than 2,000 plant species. Just a little farther along is the 612-acre Powell Butte Nature Park, offering meadows, forests, and mammal and bird habitats enjoyed by hikers, mountain bikers, and horseback riders. 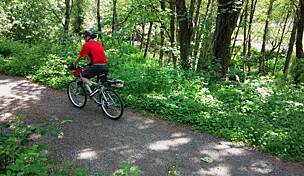 The next part of the trail leads you through a hilly area toward the Cascade foothills. Take in the grandeur of Mount Hood, which stands at 11,240 feet. The trail then crosses Johnson Creek (mile 13)—a serene spot (with covered benches) to rest your feet and relax. Farther along, you'll reach Linnemann Station, after which you'll intersect with the 3-mile Gresham Fairview Trail, which runs north and will eventually connect with Marine Drive in Portland. The path leads to Gresham's Main City Park at mile 16. If you exit through the park to Powell Boulevard, you can explore Gresham’s pedestrian walkway in the shadow of Mount Hood. MAX, Portland’s light rail, is accessible nearby. The trail ends 5 miles farther at State Route 212 in Boring. 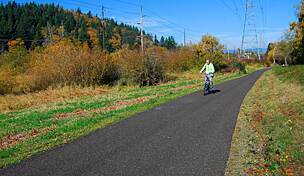 Access to the trail is available at many locations, including the I-205 Multi-Use Path. 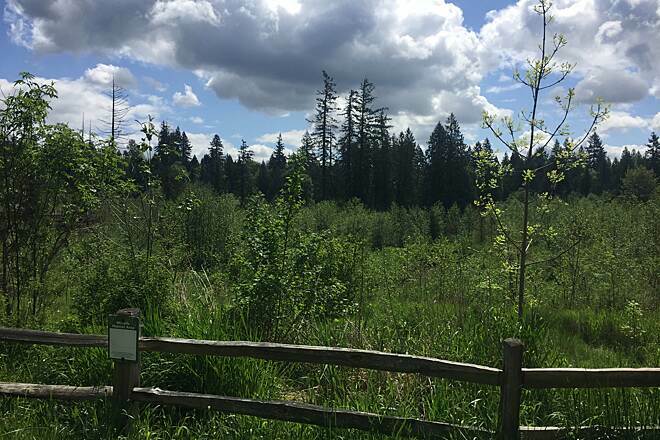 To reach the Johnson Creek Boulevard trailhead, from I-205, take Exit 16 and go east on SE Johnson Creek Boulevard for 2.2 miles. Turn left to stay on Johnson Creek Boulevard, and the trailhead is just past Johnson Creek on your right. To reach the Boring trailhead at 28000 SE Dee Street, from Gresham, head west-southwest on US 26 for 3.8 miles. Turn left onto SE Stone Road, and after 0.5 mile, take a right onto SE 282nd Avenue. Go 2 miles, and turn right onto SR 212. Take an immediate right onto SE Dee Street, and parking will be on the left. From I-205, take Exit 14. Go east on SE Sunnyside Road for 5.8 miles. Turn left onto SR 212, and follow it for 4.5 miles. Turn left onto SE Dee Street, and parking will be on the left. As of June 2017 no homeless camps. Great ride, lots of flowers and great smells Boring to down town Portland. As a female, I feel safe on this trail. Yes homelessness is a problem but no one has bothered me and I love the trail and try to pick up litter when I can. Visiting from FL, we were warned about the problems with homeless encampments between 205 and Boring. 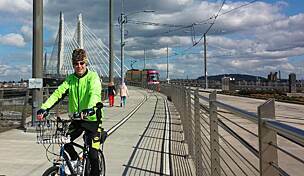 So we did a loop from downtown to Sellwood and across Tillikum bridge and up west side of river. It was a great ride with views of the Willamette most of the way. We saw only one small camp and noone bothered us. Several people we talked to around Sept. 10 said plans were to move these campers off the Springwater Corridor. Not an easy job, but it seems a shame that cyclists are too afraid to use such a nice trail. I did the very east end of this trial at the Boring end for the Boring Marathon in Sep 16. Great for running and didn't see any homeless people on the trail. whenever i go running on the trail now i see homeless camps EVERYWHERE and they leave a DISGUSTING mess EVERYWHERE! they smoke, do drugs, drink, and harass me and other people walking/running/biking on the trail. tried calling the cops but they say its such a large problem that there is nothing they can do about it!!! i don't see how law abiding, tax paying neighborhoods need to put up with this crap and when we ask the police or city to do something about it they say they can't because the problem is too big. does that mean we can all start breaking the law and as long as there are too many of us to arrest then its ok?!?!?!? Every so often I rollerskate between Gresham City Park and Boring. For the most part, this section is very flat, with lots of trees and shrubs. More bicyclists out this way. I often see one homeless man who walks that section, but generally I feel safe on this stretch - no people camping out anyway! We ride this trail as part of our scout training for our bike trip every two yrs. The last time I was on it was almost a couple of years ago and it was awesome. Very clean and lots of people using it on foot and on bikes. Last week I took my son on it to enjoy a traffic free ride for a change. I was shocked at how many homeless camps were there lots of garbage almost nobody on the trail but the people living there. It is a shame that it turned into this I am sorry that the Oregon residents have to support this with their tax dollars. I wont be back too sad such a awesome trail. This trail is a great trail, but definitely not a trail to be traveled solo. From the I205 Corridor all the way out to Gresham this trail is heavily populated by homeless people that will actually step out in front of you and confront you. They do not want you riding through their area. The path is often full of glass. See my review for I205 trail, the closer you are to I205 the rougher the scene. Perhaps one day this issue will get cleaned up for both trails but for now... Both trails make this Marine think twice and use other trails (Marine Drive) first. 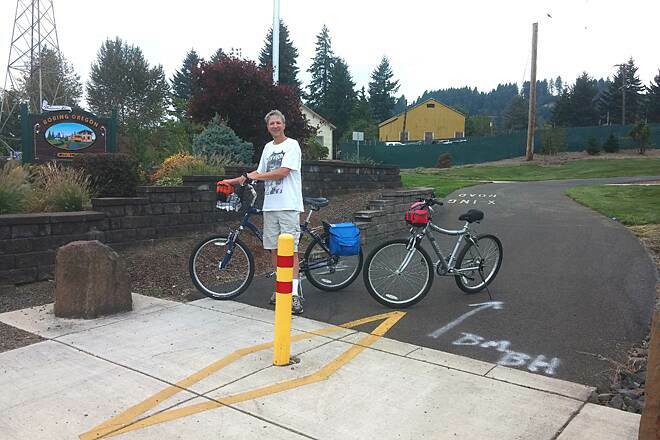 My wife and I just bicycled on the Springwater and I-205 bike corridors. Both were very scary with the number of homeless wandering along these paths many with pit-bulls straining to leap at you from their leash. One homeless man threw a rock at my wife. 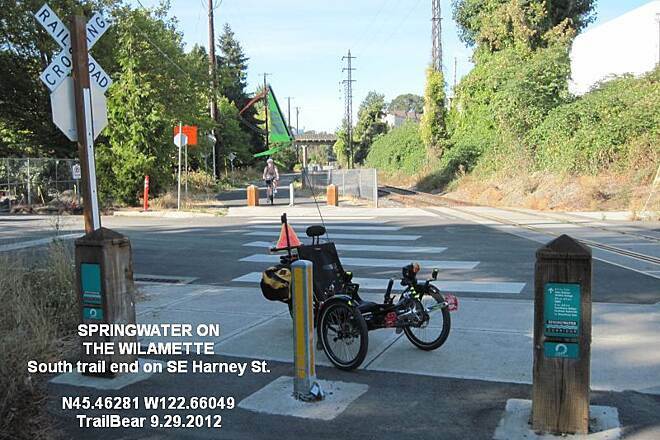 We cycled along the Springwater from I-205 to SE 19th Street in Sellwood. The absolute scariest was the segment between I-205 and SE Johnson. The ride we took today was three days after 300 homeless were apparently removed from camps along these trails. This community has spent a lot of money on a very nice trail facility to only now turn it over to the homeless. I was to lead a trip along the Springwater Corridor in about three weeks but will cancel this bike ride instead of subjecting the bikers to what I saw today. I used to love riding or walking this trail. However over the last couple years it has become completely overrun with "campers". People have blocked the trail while I was riding and yelled at me to give them money. There are PILES of garbage and stolen bikes, tent villages and open drug use. I have completely stopped using it which is a shame. It really was a great trail, but the city "leaders" of Portland refuse to enforce the law and now the citizens of Portland can no longer safely use this. 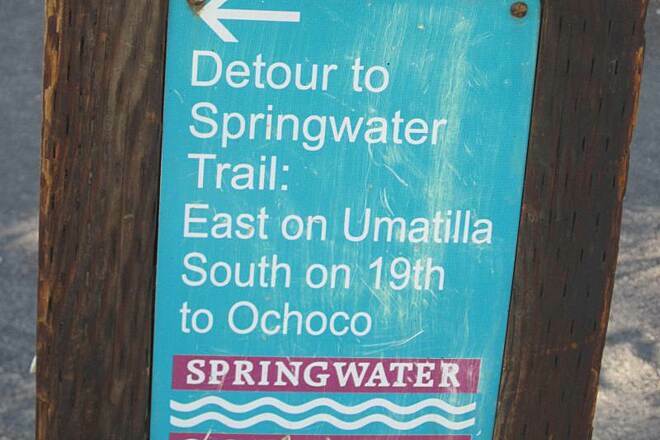 I am on this trail a lot as a group cyclist and by myself, and also as a walker and runner. I find very nice people but also many who are clueless. In a group of cyclists, we always warn people bike on left, many pay no attention, walking 2 or 3 abreast,we have to nearly stop, some with head phones, others 2 or 3 dogs, taking whole trail. Yes I see rude cyclists, but I see just as many others who hog the whole trail, let dogs run loose and don't pick up after them. This is a 2 way trail and people need to learn to stay on their side and share the trail. Please keep dogs under control. Last week, one nearly bit me while when I ran by. I recently rode this trail from Foster Road to 135th or so and was concerned about the number of homeless people and camps along the trail. As a female rider, I admit that I was uncomfortable riding alone on this stretch of trail. I rode after 4 pm so there did not seem to be as much traffic on the trail as I had expected. Does anyone know if there is a better time to ride? 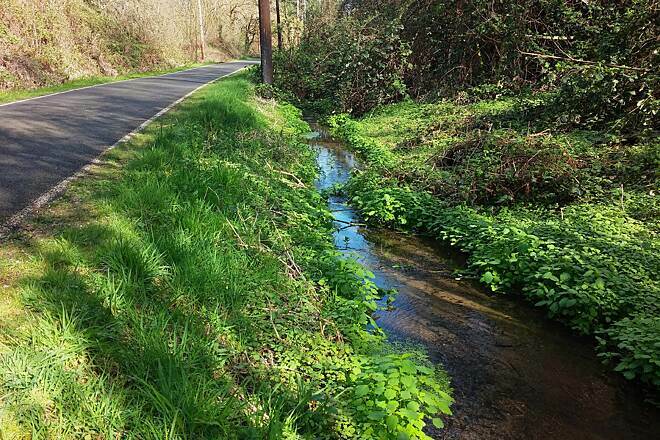 I have lived in Gresham 30 years and have enjoyed the Spring water corridor as a runner, walker, and cyclist. In the last year or 2 the trail has become a refuge for drugged out homeless people. They are aggressive and I am afraid to run or walk in spots like the overpass where the trail to marine drive begins. They camp under the overpass. They also come out of the bushes and have been known to assault women on bikes as I was warned by a female cyclist when she saw my friend and I walking between Towle and 192nd. I think it is sad that a very family friendly trail is slowly turning into a refuge where people are permanently camping in the forestry areas. It is not safe to run or walk alone during the day when there is a low census of people out on the trail. Interestingly enough the people on bicycles who are dressed in street clothing are the ones who let you know they are coming. It's the cyclists that are all geared up with fancy, quiet bikes that blow past you and done't let you know they are coming. For their own safety they need to let people know they are there. We have 3 dogs which are always on leash but you never know when a dog may run to the other side of the trail, or when a walker or runner may falter or move over! It may help to put up some reminder signs about "on your left". We've considered handing out "beep beep" horns to cyclists since their voice boxes seem to stop working when the spandex goes on. We love the trail otherwise and use it often!! Bike riders NEED TO BE MORE CONSIDERATE!!!!! I am an avid runner and I ALSO walk my beautiful, well behaved, 11 year old black lab almost everyday. I can't tell you how many times we get BULLIED or forced off the pavement because a "herd" of bicyclists aka a$$holes will come barreling down on us! And they just group together two at a time four in a row sometimes and they won't slow down, ring a bell to let us know they're coming or just go past us Single file!!!! They are just plain RUDE!!!! I now have to avoid peak hours on nice days just because there are so many of those d@ckbrains on the trail its impossible to even walk without getting RAN OVER practically every 30seconds! They act like the trail was made for them and them alone! They look at you with contempt if your JUST walking! Oh no God forbid someone would JUST want to WALK!!!! And I've made a point to try and be polite and get out of the way and I literally will get a "thank you" gesture or verbal ONLY every 20 bicyclists or so!!!! I mean come on ppl when someone does something considerate for you when they don't have to you say THANK YOU!!!!! I love this trail but am so tired of these bicyclists thinking they OWN the place! Come on the city has spent millions of dollars for them to ride on the road, why don't they just go there?!?!?! Leave the families walking with their children, people (especially senior citizens) who are just trying to have a leisurely walk, and people who are LOVING dog owners walk their dogs in peace!!!!!!! And the police or whoever have got to do a better job about the homeless LIVING in the brush/bushes! I am so tired of seeing garbage and broken beer bottles everywhere. And no one should ever have to worry about their dog being stuck by a syringe needle when walking....I literally watch for those now so she doesn't get " "stuck" by one ......so sad it's come to that. I used to enjoy the top end in Boring when it was a rough trail rocks and gravel and some mud. It was a nice place I could walk my dogs. Now it is a fast speeding highway. Speeding bicycle riders say they can go 25 mph and it is my job and responsibility to get out of their way. I take it that means my dogs also. Should they run into a dog or me -- it is my fault for being in their way. I take it to mean that also includes families with small children. Today all I said to a fast bike rider was, "Thank you for slowing down." Just saying that resulted in a 15 minute verbal unpleasant confrontation simply because the bike rider took it as sarcasm. This has been the forth or fifth similar incident. It has discourage me to the point that I am no longer using this trail since it is no longer a nice pleasant safe place for a walk. I have noticed gadgets that indicate timekeeping miles and speed data to suspect they are attempting to break some previous performance record. I hate to think what might be the outcome from some serious accident because my dog was not able to get out of the way. The bikes are rather silent and come up from behind too fast to react and yet these people refuse to take any responsibility for what might end badly. My dogs are always on a leash but sometimes it is hard to get them out of the way of bike-riders that have little or no compassion for anything in their way. I pity to think of children on trikes or toddlers on what has turned out to be a dangerous place to be with a family. The trail itself is great, but exclusive to just some users. This sorry review is the result of too many bad experiences. 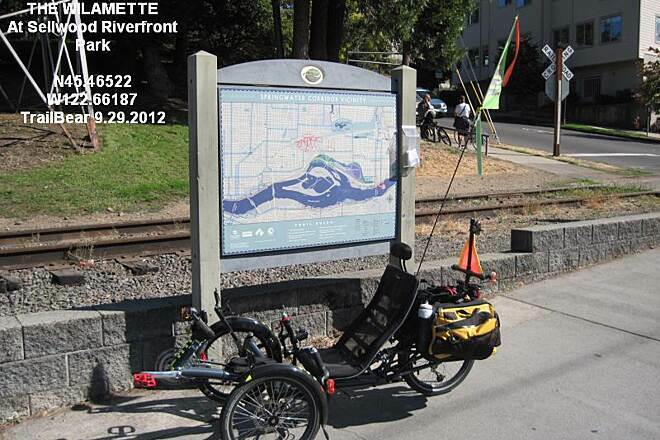 Started at the north end of the trailhead near OMSI at 10:30am on Sunday, Sept 21, 2014. The first few miles followed the Willamette River, then a couple of miles on city streets which was not bad with little traffic. There were many cyclists, walkers and runners along the way, and we had to watch for children on bikes and people with dogs on leashes. The pavement was excellent and signs were very adequate. The only disappointment was the numerous stop signs at intersections, but this is understandable. Next time I would start earlier in the morning to avoid the crowd. Wonderful trail experience. I rode this trail on Sunday morning the 8th. It was my last trail in my quest to ride all the Hall of Fame trails. 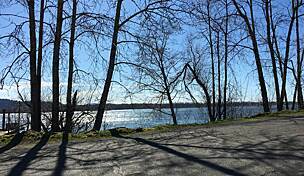 I had some difficulty in finding the western end along the Willamette River, (this needs to be remedied} but once I got going, it was a great ride. The trail has less of an urban feel because it ran along Johnson Creek and natural areas all along the way. There were lots of wild)flowers. The trail had good trail markings, but a lot of road and street crossings. It was good to ride early and on Sunday. Also the description, of the Boring terminus is incorrect. It ends at Wally St and Hwy 211 not Rugg Rd. The trail has been extended and paved the last two miles. Corridor Trail at 1:30 p.m. Feb. 1 at Boring Station Trailhead Park. 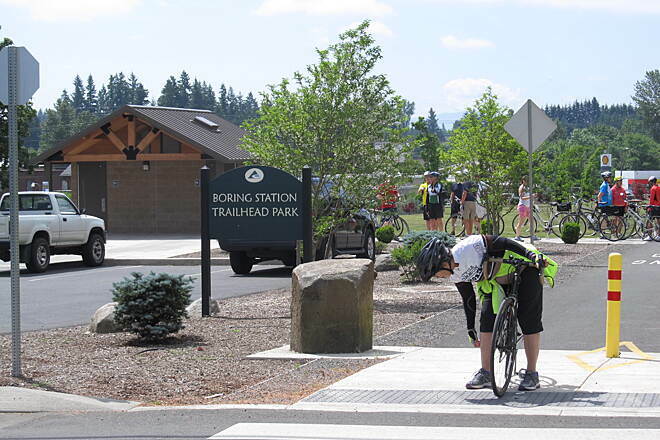 The grand opening celebration marks a true milestone for urban trails in the region – The paved Springwater Corridor Trail now extends from downtown Portland to Boring, Ore.
Clackamas County Parks recently completed the final 2.25-mile segment of the Springwater Corridor Trail, from Rugg Road to Boring Station Trailhead Park. The final project included: Widening and paving 2.25 miles of trail surface with 10 foot-wide asphalt and 2 to 4 feet of compacted gravel shoulders; significant drainage improvements; a new bridge deck and railings; improvements at the intersection of Telford and Haley Road; and enhanced signage and street crossings. 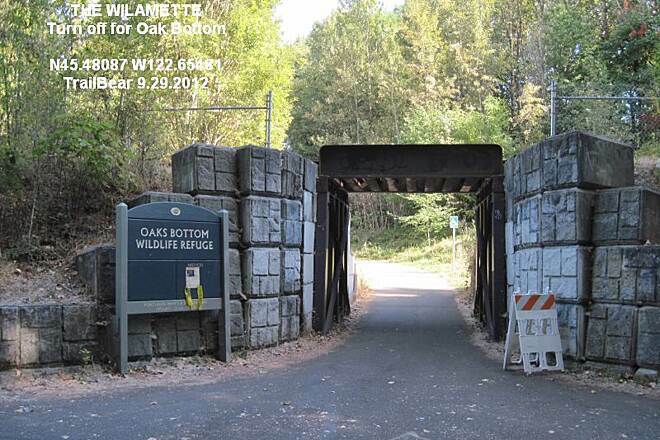 The Oregon Department of Transportation’s Transportation Enhancement Program and Metro’s voter-approved 2006 Natural Areas Bond Measure provided funding for the project, with additional financial support from Clackamas County Parks. 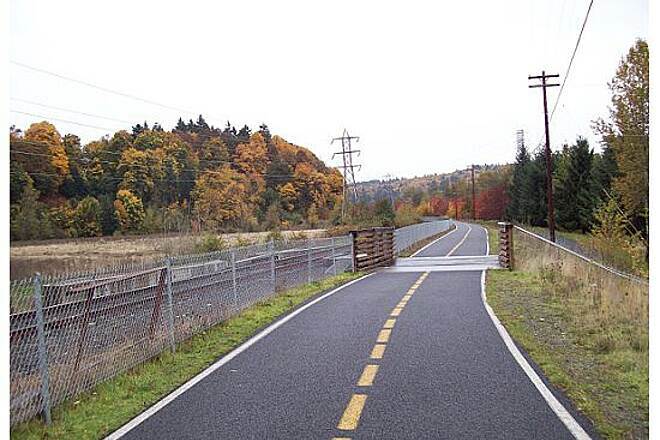 Portland Parks and Recreation owns the trail right-of-way. We would like to thank our project partners at ODOT, Murray, Smith & Associates, Inc., C&M Excavation and Utilities LLC, Metro, Clackamas County Department of Transportation, Clackamas County Board of Commissioners, Portland Parks & Recreation, the City of Gresham and Oregon State Parks & Recreation. A very special thank you goes out to the Friends of Boring Station and to the residents along the trail for their support and understanding during construction. We hope to see you at the Grand Opening of this beloved trail! 28000 S.E. Dee St., Boring, Ore.
My buddy wrote up most of our Springwater experience quite eloquently already, but I want to emphasize a few elements of our fun and fast journey. We began at approximately 50th and Division, and leisurely rolled down to OMSIish area where we began the ride. From there we basically rode nonstop save for traffic lights, photo-ops, and an occasional trail user traffic jam. We ended the ride at the Not So Boring Tavern. Soon our helping friendly ride came and we put our bikes in the bed of a trusty Ford pickup. We were safely transported the last 3 miles to our sanctuary for the night. After a beautiful afternoon of sunny 60 degree weather on an essentially car-free path, we weren't going to risk riding in rush hour traffic and forming fog. Getting hit by a car is the opposite of our goals in riding bicycles. That truck delivered us to a pizza party at my best friends' aunts house. My panniers were packing Pendleton Whiskey, and a punky party can be presumed. Early the next morning we hit the trail again. As Ed said, those first 6 miles from Boring to Gresham are easy. A bit frosty, but the sun was out. At 205 corridor trail we turned north and rode up to Division. We then meandered through the side streets with views of seemingly endless Portland bungalow funky. A whole weekend of warm sunshine in late January Portland. It is like God came down and kissed my eyes! Can't wait to ride it in verdant late spring! 1-17-2014 rode the whole trail with my best friend from the beginning, downtown Portland to the rural community of Boring. What an experience! I love riding, but hate battling with automobiles. There are road crossings on this trail, but it is such a wonderful place to ride. The surface was smooth and the asphalt was completed the entire way. Many parts of the trail are near live water, such as rivers, creeks or just spring water running down the side of the trail. There has been some recent work near Boring, paving and landscaping. This kind of space is truly a gem. Riding back to Portland there is some elevation drop and not as much effort is required especially noticeable between Boring and Gresham. Also adding a review since the others are so out of date. Eastbound from 122nd is one of my favorite routes. Very nice, smooth asphalt the entire way. Love this trail. Just wanted to update readers to this trail since previous reviews are outdated. 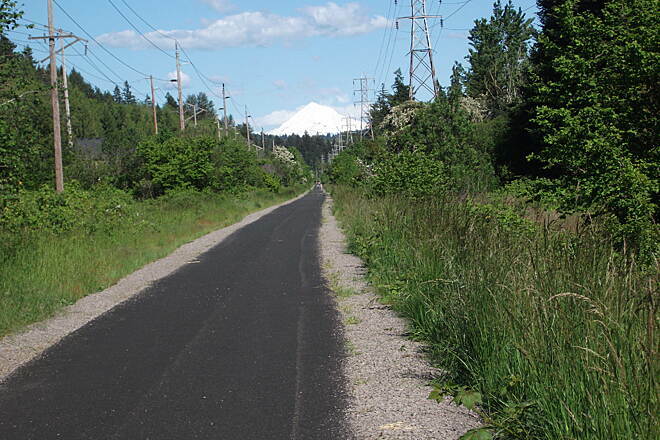 The trail was repaved last summer (2010) and is much smoother East of 122nd! Finally! The bridges and all the construction are completed and there are no issues with this trail anymore besides the last section near Boring is still unpaved. Also, one can continue past Boring now. If you look past the gas station, you'll see where the trail picks up again. It continues for another 3 miles and is also unpaved, but covered with gravel and ends at a bridge abutment. In doing some Google research it appears that Metro is trying to buy the last few remaining areas to continue this trail much farther beyond Boring and into Estacada. I took this trail end to end, well, the paved portion anyway. Overall, I found the trail to be quite well done, most of the large streets crossed had lights, and the signage was decent. Paving is rough in the Portland section, though it was quite tolerable on my cyclocross bike. The largest issue I found were the crossings not protected by a signal. Drivers were confused as to what to do, as well was I. Signage between the two sections of the trail in Portland near Sellwood were a little lacking, but wasn't tough to deal with. That being said, being able to cross the entirety of the greater Portland area, during rush hour, without much fuss and a very short section of street riding, I'd give the trail a 8 out of 10. Holy cow, this trail has got to be one of the bumpiest trails I've ever ridden on for one that claims to be asphalted. The entire trail is not as bad, but most of it is, unfortunately. My wife & I started at SE 182nd Avenue & biked west on a beautiful June day all the way to the amusement park (& onward). Around Gresham the scenery is very nice as one passes through rather bucolic settings. 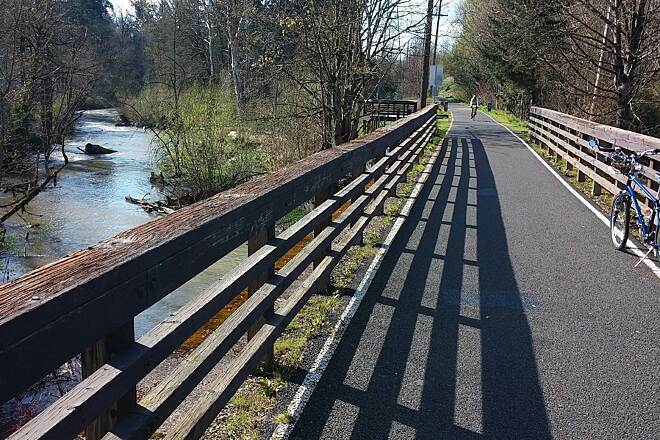 There's a bridge that has been condemned where you will need to veer onto local streets in Gresham, but the ride is fine. The absolute best part is the section that has brand new pavement as one approaches a cable bridge. Be warned: SE Umatilla Street is currently undergoing construction. There are signs that tell you this. 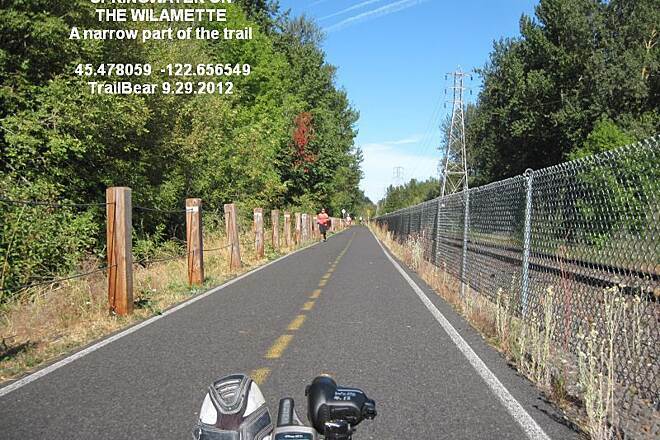 I would ride this trail again, but not east of SE 122nd Avenue. "East of the 3 bridges area, the asphalt has reached the end of its useful life. It really needs resurfacing. The detection loops for the traffic signals are too close to the road being crossed and forces the bicyclist to block the sidewalk. The loops need to be relocated to at least 20 feet away from the intersection. I did like that most of the traffic signals featured a red, yellow, and green signal for the path user. " This trail desperately needs to be resurfaced over its entire length. It could be a great path to ride but is terrible in its current state. "Starting in Sellwood on Umatilla Street, you can skate all the way to the Steel bridge, over to the west side and back over Hawthorne. There are only a few places with bad paving (between OMSI and Hawthorne bridge) but it is very short. It's a very fun trail. " 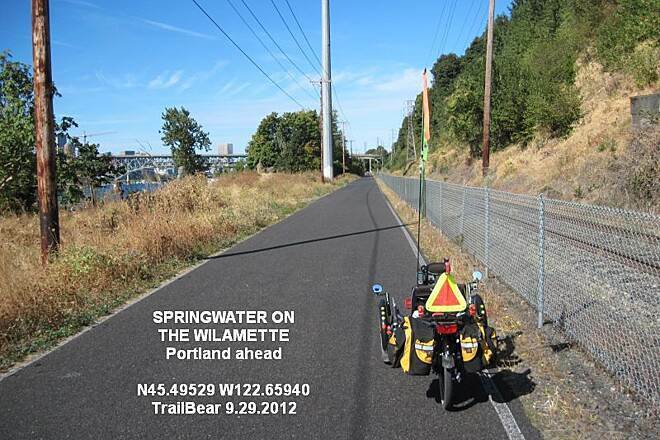 "The Springwater Corridor is a great bike path. The pavement from Portland to Gresham in nice shape. The gravel from Gresham to Boring is in nice shape too. Just east of 122nd Avenue, look for birds in the wildlife sanctuary. 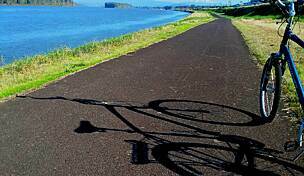 This is a great path for a daytime there-and-back bike ride." 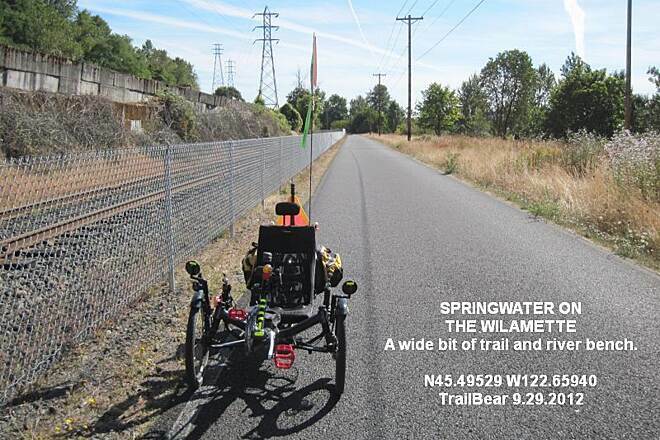 "The Springwater Corridor, while a vast improvement from other routes, is not particularly frinedly to inline skaters with its choppy asphalt and tons of gravel and barkdust. The asphalt was in need of repair or replacement years ago; now all it serves is a great way to shred wheels. " On Saturday, December 28th, 2002, my daughter Heidi and I rode a big part of Portland's Springwater Corridor, a former rail corridor that has been converted to a multi-use trail. It's one of some 1,203 trails nationwide that are listed online by the Washington, D.C., based Rails-to-Trails Conservancy. We started our journey by cycling to the nearest light rail station to our home. We took our bikes onto the light rail train, and rode it downtown. We detrained at the Yamhill District stop. At that point, we had hoped the light rain would've ended (after all, in Portland, it only rains at night and stops in the morning, right?). But no, it wasn't to be. So we donned our budget raingear including plastic bags on our feet, and headed south in Waterfront Park, and then east over the Hawthorne Bridge. 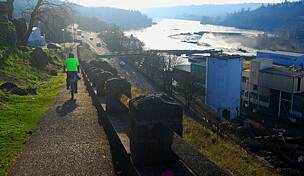 We continued south along the Willamette, soon joining the brand new trail (adjacent to the Oregon Museum of Science & Industry) which connects downtown Portland with Sellwood. Even though it was a wet, gray, and dismal day, we passed a few joggers, and perhaps one cyclist on this portion of the journey. Apparently we weren't the only crazies! Notable on this leg of the journey, is the Oaks Bottom Wildlife Refuge (with lots of Great Blue Herons--we saw a few), the floating houses on the Willamette, Ross Island, and easy access to the nearly a century old Oaks Amusement Park--hey Disneyland, you've got a few decades before you can claim that! 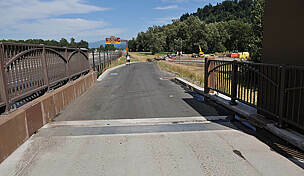 The paved trail goes under the Sellwood Bridge, and ends at Umatilla Street. 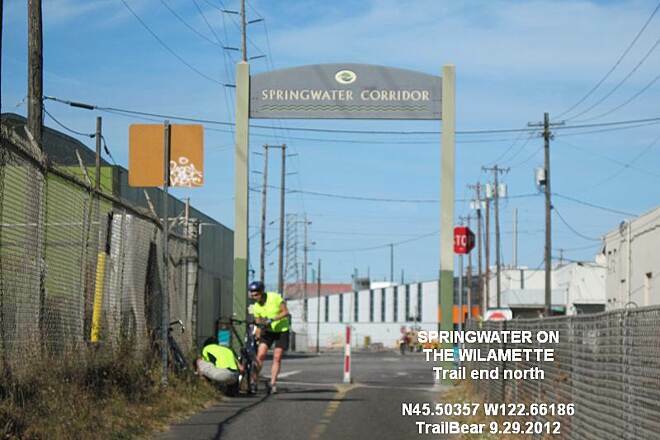 From there, we cycled the quiet surface streets through Sellwood, until we connected with the Springwater Corridor via Johnson Creek Boulevard. The highlight of this segment was a short stop at ""Share-it Square"" at the corner of SE Sherrett and 9th Street. Dubbed as ""Portland's first neighborhood public gathering place,"" it sports a reading pavilion on one corner, a 24 hour teapot with clean cups on another, and a clothes/produce/information stand on yet another (with items available to anyone who wants/needs them). The journey next took us through an industrial area that was nevertheless quite interesting. Just like riding on a train, bicycling on a former rail corridor, gives you views you'd never see if you were in a car. 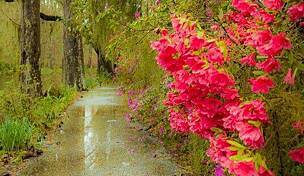 And being on a trail, away from automobile traffic makes the journey especially pleasant--even in the rain! We rode a few miles with Mt. Scott prominently in front of us, then the trail verged to the northeast as we headed toward I-205. All crosswalks on busy roads were clearly marked. We felt very safe. East of I-205, the trail goes between a few automobile junkyards. Seeing them from this perspective, rather than from a distance had we been driving, is very enlightening. I explained to Heidi the process of how our society disposes of cars, and why there are junkyards in the first place. We stopped at a shelter for a very tasty tangerine, a swig of water, and a sandwich. Later, when we crossed SE 136th Avenue, we took a break at the country store. The clerk generously gave us new plastic bags for our feet. The original ones had holes in the bottoms as a result of the minimal walking around we had done. The final part of the journey from there to Gresham Main City Park, was the most scenic. We skirted immediately to the south of Powell Butte Nature Park and continued to follow Johnson Creek. We passed by sheep grazing, and some horses as well. Birdwatchers would certainly find this part of the trail very rewarding. Near Highland Drive, the trail is posted with lots of information about the Johnson Creek watershed, early history, and the flora and fauna. We didn't have time to stop and read all of it because we were planning to meet a friend at the Gresham Public Library at two p.m.
We arrived as planned, and explored a bit of historic Gresham. It struck me how I had never seen the charming old downtown. In the past, I had always blown through on the main highway in my carpet cleaning van. After a satisfying lunch at an Italian restaurant (including the heavenly chocolate lasagna I had for dessert), we boarded the light rail train, and rode it all the way back to the Sunset Transit Center (on our side of town). Then, even though it was still raining (it never really stopped all day), and we could've waited for a bus, Heidi and I chose to ride the final two miles home. I know, gluttons for punishment, right? The cycling portion of the trip took around four hours, but we could've done it much quicker had we not stopped so often for photos, and to make a home video. But whether you're taking photos or not, there is more than enough to stop for along the way. On a dry day, and if you have a bit of curiosity and wanderlust, you could easily spend double that amount of time and still not see it all. We're looking forward to that dry warm day, hopefully at the end of May, when Mandy and Kory will join us, and we'll do the whole thing all over again. 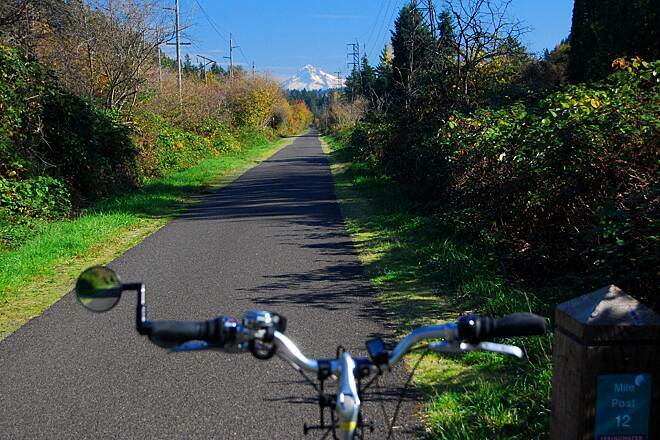 And then there are all those other great bike trails around Portland yet to be discovered. Hmmmm! Sounds like we've got our hands full!" "A great corridor that is bound to get better as Portland looks to make the connection to the Willamette River. The terrain is not very challenging and on a sunny weekend day, it gets fairly busy with good reason." "I enjoy this trail quite often, and I enjoy seeing all of the families with their children, on bikes. It can get quite crowded, but that is a good thing, too. Many more cyclists to come!"